This book is on sale on Amazon for $0.99 (regularly $3.99) 10/20/2017 - 10/25/2017! Nora Tierney can't shake the feeling she has a stalker. While she's house hunting in Oxford, her partner, DI Declan Barnes, untangles the murder of an art conservator. When these situations collide, Nora find herself fighting to save her child and the family she's trying to create. 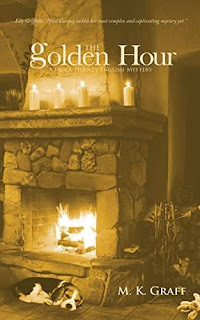 A meditation on love, loss and motherhood, THE GOLDEN HOUR blends touchingly real domesticity with tongue-in-cheek humor, as the backdrop to a tale of art theft, germ warfare, and international conspiracy.